Giving the perfect gift is easier than you think. Just leave the gift choice up to the recipient. 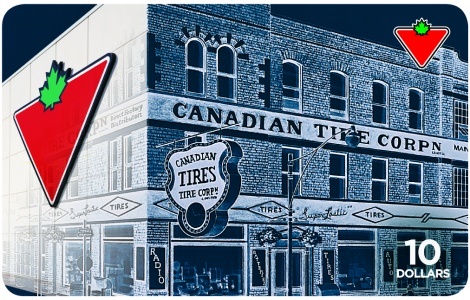 Canadian Tire Gift Cards are available in denominations of $10, $25, $50 and $100, so you can always find the appropriate gift for the occasion. They are convenient to use at over 468 stores, 465 service centres and 267 gas bars across the country and can be redeemed on over 95,000 products, including home décor, housewares, tools, and auto care. Whatever the occasion, whatever your budget, Canadian Tire Gift Cards are always a great choice. This card is redeemable for merchandise and services at Canadian Tire retail stores or gas bars. Cards may not be exchanged for cash or applied as payment on any Canadian Tire credit account. In Quebec only, cards with a value of $5 or under may be exchanged for cash. Canadian Tire is not responsible for replacing the value on this card if it is lost, stolen, destroyed, damaged or used without your knowledge or consent. Questions? Visit www.canadiantire.ca or call 1-800-387-8803.